Use this invigorating massage candle to re-energise your partner, or gift it to an eco-conscious friend in need of a pick-me-up. Fragranced using the purest essential oils carefully blended by our expert Perfumer, this gorgeous massage candle melts at the perfect temperature, providing a silky smooth sensuous experience on the skin. The refreshing fragrance is an uplifting blend of zesty mandarin combined with herby rosemary and revitalising mint for the ultimate lively scent. Sweet orange and citrusy Petitgrain add further dimension to this euphoric aroma, captured in 100% natural body-safe wax with no sulphates, PEGs, petrochemicals, animal products, or animal testing. The wonderful fragrance will brighten your mood, rejuvenate your body, and awaken your mind—while the gentle cocoa butter, soya, and almond oil will leave your skin silky soft and smooth. Each sustainably-sourced ingredient brings a wealth of benefits for both body and mind, banishing stresses and tensions while helping to re-centre your energy. Relax, unwind, and indulge as this sensational, sensual blend glides over your skin, helping all your troubles and anxieties to simply melt away. 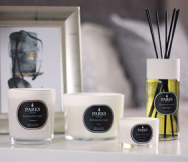 Parks massage candles make a wonderful, innovative gift—ideal for those who could use a little pamper time. Each candle comes in a stylish porcelain pot that enables easy pouring once the blend has melted, and can be reused once the product itself has finished. Our mandarin, rosemary, and mint massage candle is beautifully presented in an attractive, sleek white box with black trims and our iconic branding—ready to give as a thoughtful and sophisticated gift.